sometimes I just want to have a glass of wine, watch a movie, have a little snack, open a bottle and just enjoy drinking it; not "tasting" it, not "swirling" it, not "looking at the hue”,not "nosing" it. The nose was seriously intoxicating, aromas of violets and lavender were wafting from the glass, like a field of them in the early summer with a breeze blowing the scents to you. The color was more brick than dark red, the fruit of the palate was generous; light cherry but then drifted into darker toned fruit of blackberries with just a touch of spiciness and beautifully dry, but not too dry; like the Baby Bear of Dry, just right! So then I had to do some research about the damn wine because that's what I always do. 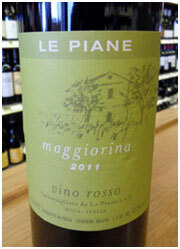 It’s from Le Piane, a region I'd never heard of before in the Piedmont area called Boco. It’s a field blend (meaning they just ferment whatever grows in the field together and that's the make-up of the wine). Turns out it is 40% each of Nebbiolo and Croatina (a grape I'd never heard of) and the rest made up of 10 other local varietals some of which are white. The story of the winery is fascinating. An older couple in their 80's were basically the only ones left making wine in the Boca region, with vines from 40 to 100 years old. A couple of guys happened by at just the right time and voila, they bought it, with a promise to keep Antonio's (on the left) vision and centuries old practices. That was in 1998 and by the accolades they have been receiving it seems they have done that to perfection. You seriously will not find another wine on the planet that tastes like this one does. It is intoxicating (in both ways I guess) and at only $21.95/bottle is very affordable as well. We toasted Antonio while "tasting" and "swirling" and "nosing" a wine he literally saved from extinction; you probably should do the same!